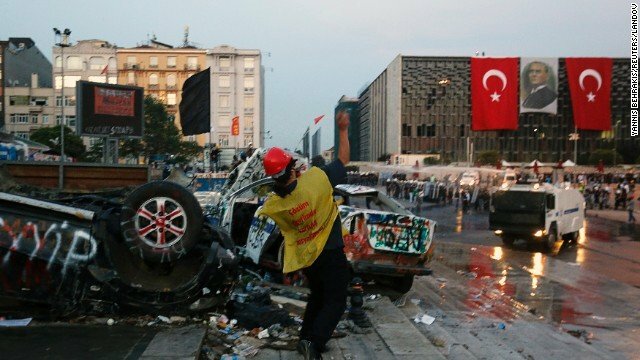 Gezi Park protesters have clashed with Turkish police in Istanbul, after riot squads used tear gas and water cannon to eject demonstrators from the park. The protesters quickly fled the park, but later erected barricades across nearby streets and lit bonfires. Witnesses said it was one of the worst nights of unrest since the park was occupied 18 days ago. Police blocked off the Bosphorus Bridge to stop demonstrators reaching Taksim Square, where the park is located. Clashes continued into Sunday morning in the streets around the square, eyewitnesses say. On the square itself, bulldozers went to work, clearing away the protesters’ abandoned barricades. Thousands of people also took to the streets of the capital, Ankara, to express support for the protests. The Confederation of Public Workers’ Unions (KESK) also said it would call a nationwide strike on Monday, while another union grouping is deciding whether to join the action. Medical officials estimate that 5,000 people have been injured and at least four killed since protests began in earnest on May 31. PM Recep Tayyip Erdogan is due to hold a rally in Istanbul later on Sunday. The protests began as a local protest against a plan to redevelop Gezi Park, but snowballed into nationwide anti-government protests after the perceived high-handed response of the authorities.